The other day I shared this card with you and mentioned that I made several at the same time, so this is the second that I'm sharing from that batch! This was the first piece of card that I pressed into the wet ink (method described in full here), so the colours are more clearly defined. When they were dry, I stamped the card fairly randomly with a text stamp and Bermuda Bay ink. I stamped my main decorations in Basic Black Archival Ink and then used a heat tool to ensure that they were dry before adding some more colour with a Bermuda Bay Stampin' Write Marker. 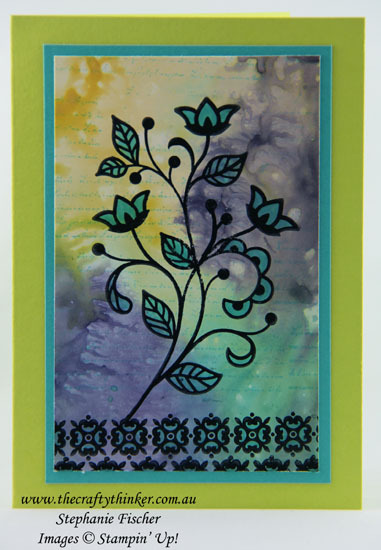 The decorative piece is layered onto Bermuda Bay and the base card is Lemon Lime Twist.